Try standing on one leg, you might need to stick your arms out to help you balance! Now try standing against a wall with your shoulder and leg/foot against the wall, try and lift your other leg outwards – it’s impossible! That is because your body is trying to move the opposite way to stay balanced, but can’t because of the wall! 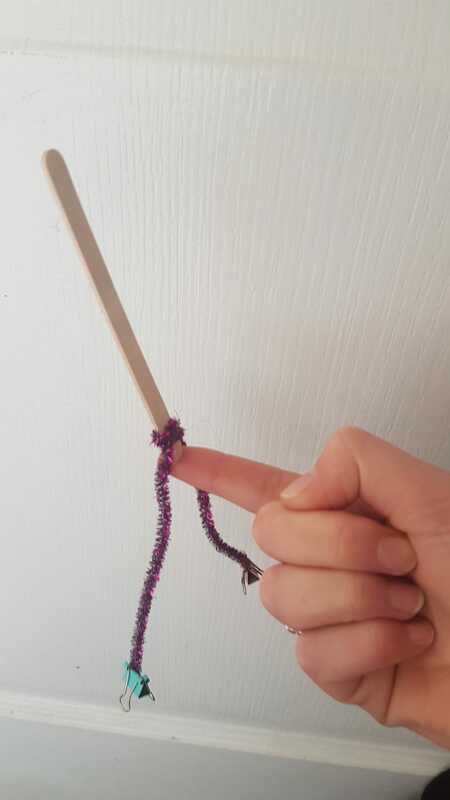 Wrap the pipe cleaner around the stick, near the bottom, so that the two ends are hanging down like legs. Put one bulldog clip or 2 paper clips on each ‘leg’ of pipe cleaner. Try to balance it on your finger! Make sure both legs of the pipe cleaner are pointing straight down. If they are sticking out to the side it wont balance properly. Everything has a centre of gravity. The centre of gravity is the point of balance where the forces are equal on both sides. By adding more weight to the bottom of the lollipop stick, it lowers the centre of gravity and allows it to balance on your finger!